The 16 billboards have the phrase, "Abortion is ________," each with a different word or phrase filling in the blank, like "Abortion is necessary," "a second chance," "gender equality," and "a blessing." Women should never be made to feel that abortion "is necessary." Instead, women need to know that there are pregnancy resource centers with perfect strangers ready and able to assist. We know from the Guttmacher Institute, the former research arm of Planned Parenthood, who are at highest risk: Three out of four are the poorest among us. Abortion doesn't enrich their lives. Most are women of color (61%). Their children are as precious as anyone else's. Fifty-nine percent are already mothers.They know it's more than just a "blob of tissue." (Aren't we all.) So abortion providers are making adjustments to overcome concerns of distraught women reconsidering their abortion before they walk out of their clinic. During my study of the internal training documents of Planned Parenthood, revealed in "Manipulation," the Fall/Winter 2016 issue of Feminists for Life's magazine,The American Feminist, we see this new effort in the abortion industry to "normalize abortion" as a "life event similar to having a baby, getting married or divorced, or losing a loved one." You see that strategy in these Preterm billboards. Cancer is normal, too, but we don't want everyone to experience that. Then there is Preterm's strange claim that abortion "is gender equality." The author of the Equal Rights Amendment and suffrage leader who successfully led the movement to achieve the 19th Amendment which granted American adult women the right to vote was a young woman named Alice Paul. When she grew old, she cheered as the National Organization for Women adopted support for the ERA at their second meeting, but when a friend asked what she thought of linking abortion to women's rights, she asked, "How can one protect and help women while killing them as babies?" and declared, "Abortion is the ultimate in the exploitation of women." Preterm states that they aim to "shift the public conversation on abortion away from the black-and-white political rhetoric." We do, too. 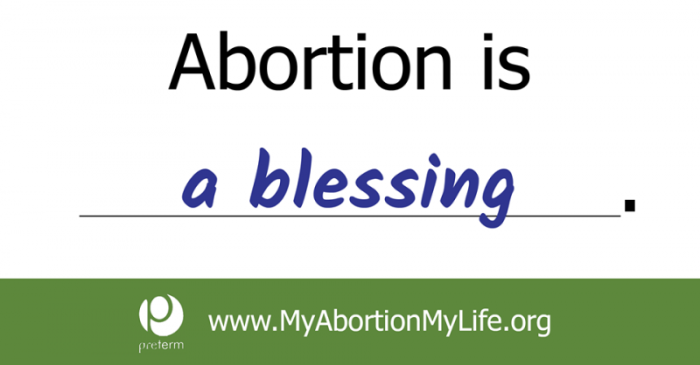 Abortion is a reflection that we have not met the needs of women. Susan B. Anthony, whose birthday we celebrate on February 15, urged the movement to address the root causes that drove women to abortion. As Feminists for Life, instead of normalizing abortion, we seek to normalize the resources that women need and deserve by moderating FFL Pregnancy Resource Forums℠ on campus and developing a new online resource, WomenDeserveBetter.com. As we approach the Centennial Celebration of the 19th Amendment in 2020, let's follow in the footsteps of our feminist foremothers and redirect our efforts to address three major unmet needs of women: lack of education, lack of accommodations in the workplace and school, and lack of paternal support. Our feminist foremothers knew that abortion isn't the answer because they considered children a blessing. Serrin M. Foster is president of Feminists for Life of America and is the creator of the Women Deserve Better® campaign. Foster's landmark speech, "The Feminist Case Against Abortion," has been recognized as one of the "Great Speeches in History" in an anthology called Women's Rights. FFL is a nonpartisan, nonsectarian organization that welcomes all who share our mission. Like Susan B. Anthony, we seek to eliminate the root causes that drive women to abortion, in particular, lack of resources and support.